1948 Buckminster Fuller Architecture Class. The Venetian Blind Dome. Courtesy of the North Carolina state archives. Today, when so many American art schools are concentrated in New York and L.A., blocks away from the galleries where students hope to exhibit their work upon graduating with thousands of dollars in debt, the idea of an arts institution in rural North Carolina might sound charming but harebrained. Yet from its inception in 1933 to its dissolution in 1957, the tiny Black Mountain College, located near the small town of Asheville, was a bastion of adventurous art rivaling the cultural capitals of the world. “Black Mountain and Its Legacy,” an expansive group retrospective co-curated by Robert S. Mattison and Loretta Howard, offers a densely packed overview of the diverse artistic currents generated by the students and faculty of this groundbreaking institution. "Black Mountain College and Its Legacy" (2011); installation view, Loretta Howard, NY. Black Mountain’s uncommon blend of creative autonomy and serious competition must have been invigorating for artists like John Cage, Merce Cunningham, Robert Rauschenberg and Cy Twombly, who made radical advances in their work during their years there. Seeing the unruly Abstract Expressionist works of Franz Kline rub shoulders with Josef Albers’s precise geometric paintings, futuristic environments by Buckminster Fuller and Minimalist sculptures by Kenneth Snelson, the mind boggles at the range of artistic possibilities that were discussed and tested at this school. If the exhibition invites viewers to imagine such an incredible scene, it also satisfies their nostalgia with portraits of Black Mountain students and faculty, taken by photographers Hazel Larsen Archer and Harry Callahan. Alongside these, there are outstanding abstract photographs by Aaron Siskind, which render stripped commercial signs in close-up to amplify their surface distortions, like an abstract painting with elements of collage. Other highlights from lesser-known artists include architectural sketches by Robert Lippold and collages by Susan Weil. The show disappoints only in choosing later works by well-established artists, where a stricter focus on their Black Mountain period would be more illuminating (Albers is mostly represented by 1960s paintings, and John Chamberlain by his famous torqued car sculptures, for example). By concentrating on this singular moment, such an exhibit would provide a more engaged look at Black Mountain’s pedagogic legacy, at a time when cultural workers are envisioning alternatives to the existing art schools. 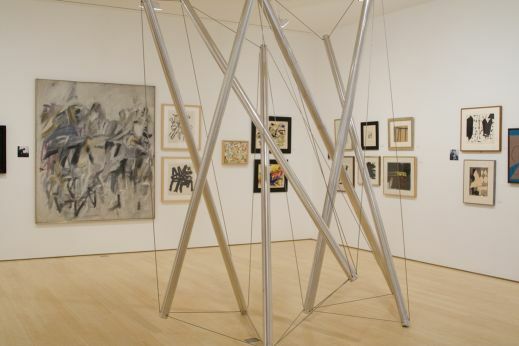 "Black Mountain College and Its Legacy" was on view at the Loretta Howard Gallery, 525 West 26th Street, New York, between September 15–October 29, 2011.